It's been fun (and challenging) meeting my blog's original promise of keeping the metro Atlanta belly dance community informed about all the events coming up in the area and breaking down barriers among the various local "gangs." I'd still like to see the blog have a life beyond Facebook, but it's all good. I'd also love to see more people proactively sending me items to post, but that's been picking up as well. Meanwhile, I'm continuing to comb the events I see on Facebook and on the web sites of various local instructors, performers, troupes, and show producers (when they're kept up to date, hint hint) and capturing everything on the calendar. Blogging is surprisingly time-consuming, but the feedback I've gotten from many members of the community has been really rewarding. I'd like to start adding more personal content to make the blog more than just an event listing resource. I'm not in a position to review shows (though of course I have opinions). There are other writers out there (particularly Dahne of Belly Dance Examiner) publishing interviews with local teachers and performers. But I think I may share more about my personal journey. I think each of us has an interesting and unique story of how we got involved in this art form, what we enjoy about it, what we find frustrating, and above all what keeps us interested and motivated. 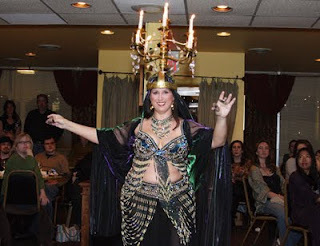 If there's anything I've learned, one's own belly dance journey is likely to be marked by constant change and evolution. New teachers will always be coming along to build on, enrich, and sometimes correct things you've already learned. We're always discovering new performers to watch and admire (I know most of us are familiar with the term "my new girl crush"). Changes in our lives outside of dance interact in interesting ways with our dance lives. I'd like to start sharing more of my personal journey, and I hope I'll find even more connections with others in the community who have shared some of the same experiences!